Peet Venter testifies before the judicial commission of inquiry into state capture. The commission adjourns until Wednesday 10:00. Venter says Watson asked to register a company for the purpose to do marketing and branding of Bosasa. He says he was ordered to pay Gouws R24 000 to cover her bond. Venter says he was instructed to do annual tax returns for Linda Mti, Patrick Gillingham and the directors to Bosasa. He says Watson wanted to ensure that taxes of his directors were done at one point. Venter further clarifies that since September 2018, he has had no contact with Van Tonder, Agrizzi or Watson. Venter says he called him to a meeting where he tried to prove to him that services were rendered for the invoices. He says Watson questioned his loyalty. Venter says the invoices had upset him. He says Watson knew that they were sent to him by Agrizzi. Venter said Agrizzi would call instructions. He said he had no choice but to comply, because Agrizzi held it against him. He signed it on 18 December at a police station. Says he quickly went through it the morning of. In April 2018 Bosasa approached me, they must have monitored my phone calls. I cut off communication with Agrizzi thereafter. President Cyril Ramaphosa’s son has denied that a R500 000 payment by corruption accused company Bosasa was for his benefit. Andile Ramaphosa spoke to News24 shortly after the president, responding to a question from DA leader Mmusi Maimane in the National Assembly on Tuesday, confirmed that he was aware that his son had a business relationship with Bosasa. Maimane brandished a proof of payment which has a handwritten note - "Andile Ramaphosa payment on instruction [Bosasa CEO] Gavin Watson" - and the party later released a sworn affidavit by auditor Peet Venter in which the payment is mentioned. Watson paid the R3m from his personal account to Miotta. Then Venter made the several payments by instruction. Venter deals with a third payment of R3m. R2.5m went to a residential property of a Ms Gouws* and R500k went to a trust of Ramaphosa's son, Andile. The money was paid into Miotto from an account of a company called Lamazest. Used to call it one of Watson's group of companies. Venter was instructed by Watson to make this payment. Venter now deals with the payment of Hlaudi Motsoeneng's legal fees. Venter says he was instructed by Gavin Watson to make the payment. "I can't remember why but he was not scared of leaving info with me, Agrizzi wanted me to share it with Watson" - Venter @TeamNews24 . Venter says, when Agrizzi emailed him the statement, he saw that there were changes made, but signed it anyway. Zondo: Did you take the statement with you on that day? did you make a copy? Venter: I've printed so many documents at Mr Agrizzi's house. At the restaurant, he didn't bring the statement along. He said he would email it to me. The flow chart refers to information being leaked to media and various political parties. #StateCaptureInquiry : Venter shows the flow diagram states that if all was successful, "they would conclude and hand over documents" . If it was unsuccessful, "it would trigger social media, banks, auditors, politicians - he would use all of this against #Bosasa " @TeamNews24 . Venter now deals with a flow diagram Angelo Agrizzi used as ammunition in negotiations with the Bosasa group. Zondo says he cannot understand why he (Venter) was concerned about doing something that was right. Venter says what went through his mind was that they would lose the audit. Going against Watson meant that we would lose audits, lose big portion of income, we would lose a lot of things, Venter says. "He would use what he knew against you, to expose you" - Venter @TeamNews24 . No one would dare go against Agrizzi, Venter says. Zondo asks him to elaborate on this. Venter: He would look at what you have done, he would use it to expose you. Zondo: So he will take the knowledge of what you have done and use it to his advantage, against you? Venter says there was no reward, no monetary value was promised. Venter: However, I was worried that if I make a statement I would lose my job. I expressed my concerns to Agrizzi, he asked me "how much do you want? I'll pay you. Join our group against Watson." The offer was not to fabricate information, but to testify against Watson and expose him. The facts Agrizzi would remind him of were all truthful, Venter says. Venter was at Agrizzi's house, where they drafted his statement. Venter says he was hesitant, felt uncomfortable. They explained to him how it should be done. They would remind him of certain things he should put in. Venter: Agrizzi threatened me with invoices. He could destroy me. Venter: I didn't want to do it. Agrizzi came to me, he showed me all the evidence, documents that accumalated over time. He said to me that 'you either go down with Watson or you prepare a statement like we've done'. Agrizzi, Watson, Van Tonder were paid from Consilium as well as the Bosasa group. The records reflected them as employees. 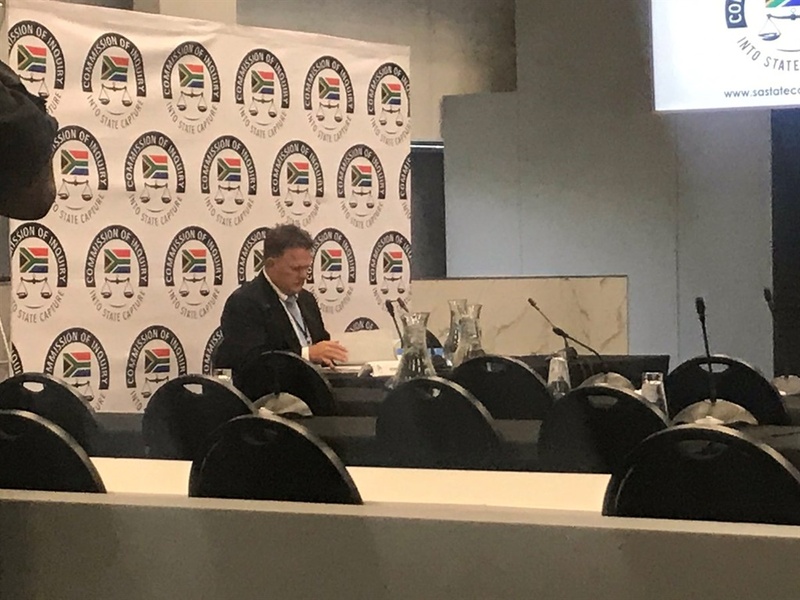 #StateCaptureInquiry : "approximately 25 employees were payed by Consilium" - Venter @TeamNews24 . Confirms he was involved in Consilium. Approximately 25 employees employed by the company. #StateCaptureInquiry : Venter now moves to Consilium , an independent labour broker company that provided services to the #Bosasa group . This company handled the payroll and would employ people on behalf of the #Bosasa group @TeamNews24 . Venter says that he terminated Miotto. "It only operated for approximately 2 years or so, I considered myself to be the financial manager of the business," Venter added. #StateCaptureInquiry : Venter explain how TRM which was providing services to #Bosasa invoiced a company called Miotto (which was not providing services). Miotto would then invoice #Bosasa at a higher inflated rate for the purposes of a commission @TeamNews24 . "I advised Bosasa to make use of TRM, they were concerned because Erasmus was a well known tax litigator. I was then told to contract TRM myself to the benefit of Bosasa."